So I didn’t post last night since I couldn’t bring myself to make an ice cream sundae after eating a lovely free range local chicken from my farmers market… food coma. How is an ice cream sundae related to rhubarb? Well I’ll tell you. On Sunday afternoon I frequented my neighborhood Shake Shack for a delicious ‘shroom burger, cheese fries, and a frozen custard sundae with (drumroll please) RHUBARB COMPOTE. It was probably the best thing I’ve ever eaten so I knew I must recreate it. First you will need rhubarb. 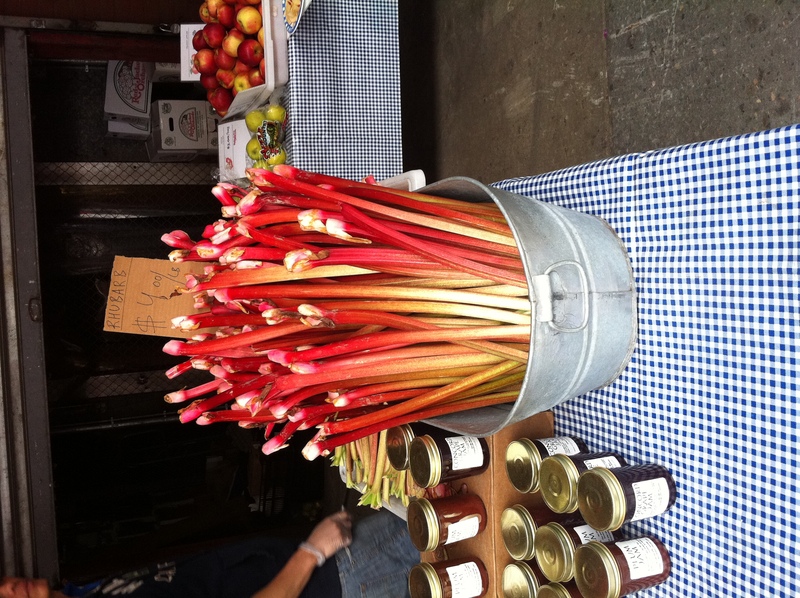 I found some lovely rhubarb at the Fulton Stall Market in my neighborhood. 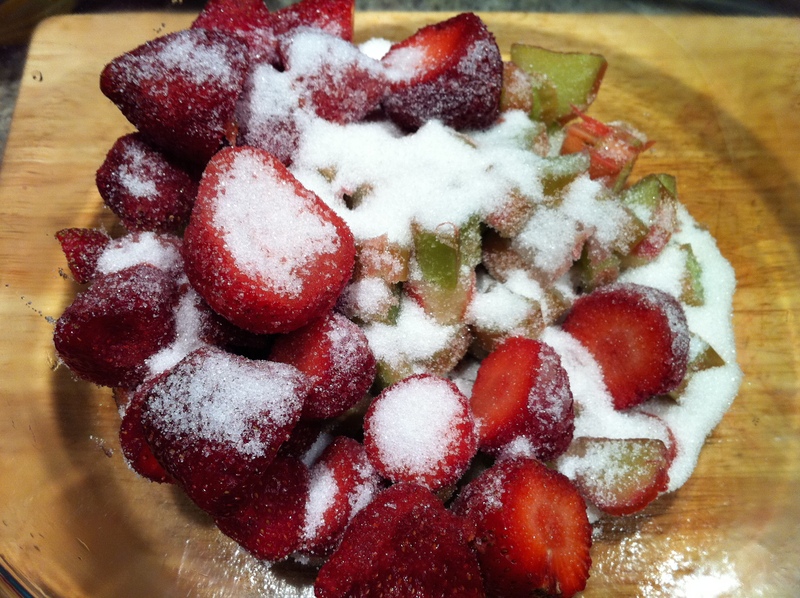 Then for a little sweetness, some strawberries (1 pint) and sugar (1/4 cup). Slice the rhubarb about 1/2″ thick, you will need about 2 cups. Place all ingredients in a bowl and toss well. Now for the challenging part – put the bowl in the microwave, and microwave on high for about 8 or 9 minutes or until all of the fruit is mushy. With a fork, crush any larger pieces of fruit until the compote has the consistency of jam. Now you are done! This will keep in the refrigerator (in an airtight container) for quite some time. And NOW for the sundae! You will need a pint of ice cream (I prefer homemade or Haagen-Dazs FIVE Vanilla Bean, and some really delicious cookies (I used Tate’s butterscotch pecan, AMAZING). 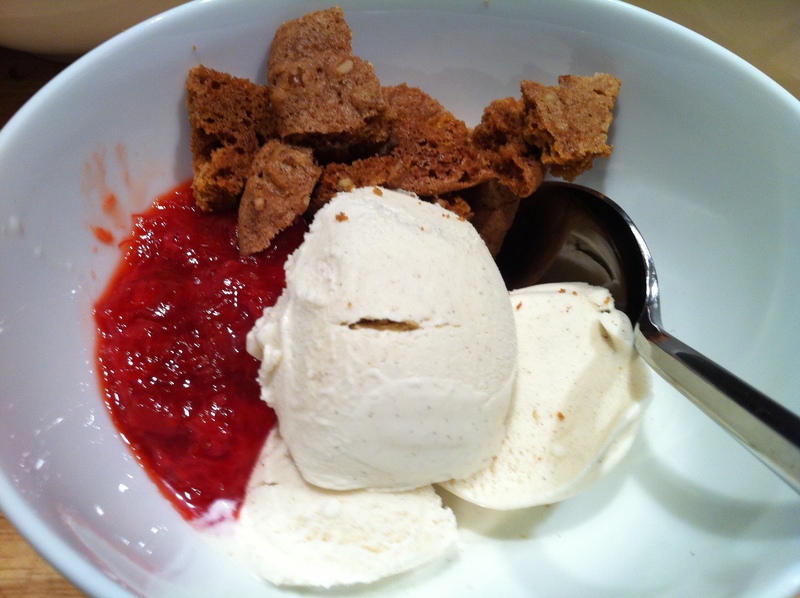 Into a bowl goes the ice cream, a spoonful of the compote, and a crumbled up cookie. Seriously, what could be better? This entry was posted in Rhubarb and tagged compote, dessert, Haagen-Dazs, rhubarb, shake shack, strawberry, sugar, Tate's. Bookmark the permalink.